When Wavelength saw DIANA bumped into Marnie Stern's 2014 headlining slot after that winter's polar vortex grounded her flight, the three-piece (and then live member Paul Mathew) were still breathing new, augmented life into cuts from the gorgeous, buzz-kissed Perpetual Surrender, repackaged with exciting left turns and flourishes. Since then, the group have been the subject of some reimagining, and despite the title, unveiled Familiar Touch and its own sumptuous grooves as the effort of a new, all-star seven-piece ensemble late last year. 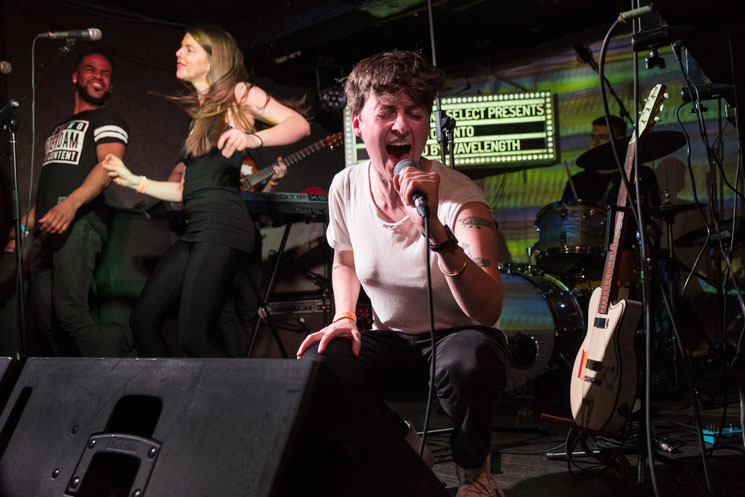 Bringing that version of the group to Wavelength, DIANA delivered a 45-minute set that fittingly only dipped into Perpetual Surrender for "Born Again" — the rest was an ecstatic, colourful celebration of the band's evolution and a group that's truly found its voice. Vocal duties now shared by Carmen Elle and supreme backing vocalists Gary Beals and Ivy Mairi; the three locked into each other at the front of the stage instigating dance-offs and cheering each other on, and their energy permeated throughout the room with the dance floor responding in kind. "Miharu" and "What You Get" — the tracks most prominently featuring backing vocalist Gary Beals' soulful cries — were standout performances, as was "Slipping Away," and as Beals sang the latter's post-chorus, you had to nod (and cheer, and dance, and applaud) in agreement. "Let it go / Start again," indeed — but let's hope they stick with this configuration for a while.